These globe compact fluorescent light bulbs use 9 watts each. When we moved in to our new house there was not a single efficient light bulb in the whole place. That’s pretty unusual Efficient light bulbs have been on the scene for almost 20 years. I remember getting a coupon from our electric utility for a cheap compact fluorescent about 14 years ago. Nicholas went right out and used that coupon. I was still in my infancy as an energy geek and didn’t much care about it. Since then our state has had an aggressive campaign to get compact fluorescent light bulbs into homes. Prices are subsidized to help folks buy compact fluorescents and retailers like hardware stores and supermarkets are coerced (in the nicest way) to give them shelf space and to stock specialty bulbs like these globes in our bathroom. So, a house with NO efficient light bulbs? How? Who? Why? We’ll never know. But clearly we wanted to swap those light bulbs out right away. Right away? Really? Top priority? Well, yeah. Lighting may seem kind of uninteresting compared to… the water heater? Insulation? OK, none of this stuff is inherently more interesting than any of the rest of it. But here’s what makes light bulbs top of the list for any energy saving effort: they’re cheap to buy, expensive to operate. An incandescent light bulb, the bulb that Thomas Edison refined, is best described as a tiny, fragile heater that you only use at night. 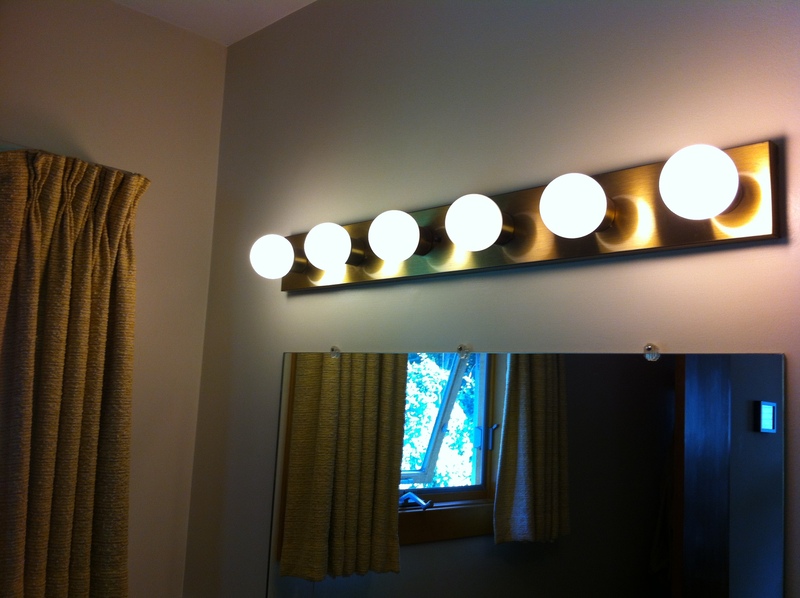 In the past lighting was one of the biggest electrical uses in a home (typically second only to the refrigerator). Because incandescent light bulbs make so much heat, they use a lot of electricity. And in the summer, they make your house hot. However, if you choose an efficient light bulb the electricity you save can pay the cost of the new light bulb back in as short as a year, yet they last 5 years and up. So we started buying new light bulbs the week we moved into the house. Honestly, it seemed quaint those incandescent bulbs: kind of like kerosene lamps. But every one of those bulby-shaped bulbs was an opportunity to time warp from the 19th century to the 21st century. And now the hard part… Which lighting technology to throw our lot in with? I’ve been screwing compact fluorescent bulbs into other people’s lamps for so many years I’ve become institutionalized about fluorescents. I can tell you how many micrograms of mercury in a compact fluorescent. I know how many lumens you want for replacing a 100 watt incandescent. I can talk color rendering index and color temperature. And I know there is no such thing as a full spectrum compact fluorescent, but also there’s no such thing as a full spectrum incandescent bulb. I’ve been a fluorescent booster. I’ve also spent much of that time cooling people’s excitement over LED’s. I’m still at a loss to explain how LED’s so successfully caught the popular imagination. Catch it they did, and long before LED’s were good enough for residential general lighting. Three years ago LED’s had color problems, poor temperature control, low efficacy (the lighting term for efficiency), short life, high cost… I told people, it’ll be five years before LED lighting is ready. A year ago DOE announced the L Prize: a replacement bulb for the 60 watt incandescent with an efficacy of 123 lumens per watt and a raft of light quality and longevity credentials. I wish I could say I’ve never been so wrong. Actually I’m exactly that wrong quite frequently. This cold cathode compact fluorescent could last for 50 years. They’re used for marquis because they can blink and not wear out. Here it was just the brightest efficient bulb that fits. In the end we used both compact fluorescent light bulbs and LED light bulbs to replace all those dinosaurs. As much as I wanted to make my home a showcase for fluorescent lighting, every compact fluorescent I bought seemed like an already obsolete technology: like my dad getting into the pay phone business in 1999. For the first time I saw an L Prize bulb in a store, for $20. The price may seem ridiculously high, but that’s actually an amazing bargain. I bought one. 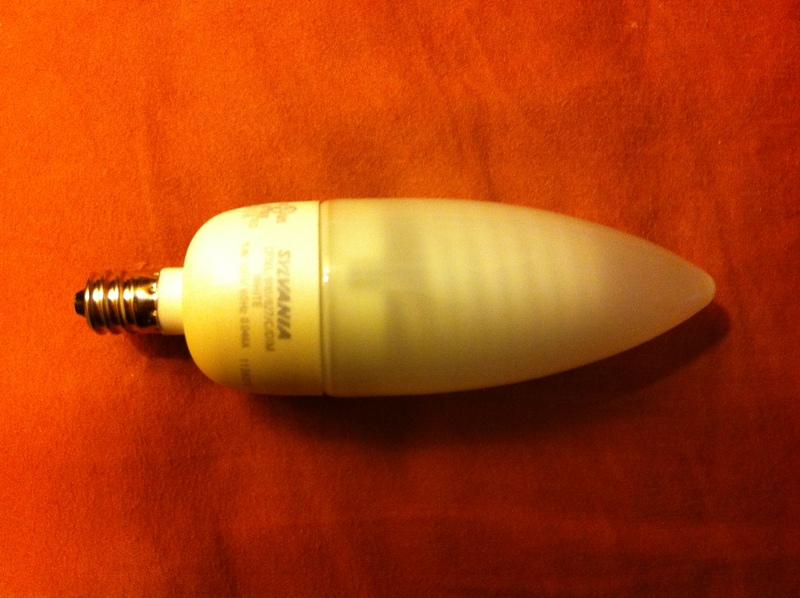 A week later Nicholas found the L Prize precursor on clearance for $5 per (Philips made a near-L Prize bulb while they were developing the really good one for retail marketing). We bought a couple cases. The fluorescents are the globes in our bathroom, the reflector bulbs in the outdoor spotlight and some super specialty bulbs in our ceiling fan: cold cathode, candelabra base. By all rights we shouldn’t have to replace a light bulb for at least 5 years. The L Prize bulb went into the only dimmable fixture in our house: over the dining table. It should last 20 years. Now there isn’t a single non-efficient bulb in the whole house. We’ve cut our lighting wattage about 80%. The light bulbs can go back to being humble and inconspicuous. Now they’re just foot soldiers on our march toward energy balance. I just counted 36 bulbs in our little house. Most of which were “quaint” 60-Watt bulbs (some were 100W) when we moved in and are now mostly 12.5W LED bulbs. As Li Ling said, this drops the lighting bill by about 80%. Li Ling didn’t mention that we also added some new lighting. She found some LED strip lights that stick under the kitchen cabinets and get power from a small battery pack that sits inside the cupboard. This was a pretty easy retrofit that adds lots of light where you need it but didn’t cost a fortune and didn’t even need an electrical permit. Another discussion point that is very pertinent for me is the mercury issue. CFLs have mercury in them. It is a very small amount of mercury but nonetheless, it is toxic and must be treated as such when it comes time to throw the bulb away (take them to the hazardous waste depot!) It was always very stressful for me when someone accidentally broke a CFL because that mercury was now in our house. LEDs on the other hand, contain no mercury. This is a big plus for me, both for the personal environment we call home and the bigger one we call Earth. I love this blog, Nik & LiLing!